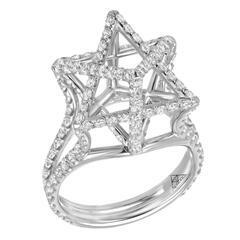 Merkaba 18K yellow gold ring, featuring a total of approximately 0.98 carats of round brilliant diamonds, F-G color and VVS2-VS1 clarity. This three dimensional architectural design extends upward from the hand 0.43”. Size 6. Can be sized to fit. *Each piece comes with a certificate of authenticity and unique serial number. *Made by extremely skilled hands in the USA, Merkaba is a shining chariot for global unity. Such a cool retro style! 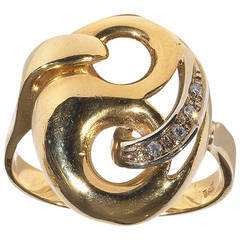 In 18 karat yellow gold, an overlapping leaf design, with a row of diamonds across the center. Size 6 1/2. Fun and different - for any finger! In 14 karat yellow gold, size 7 1/2.